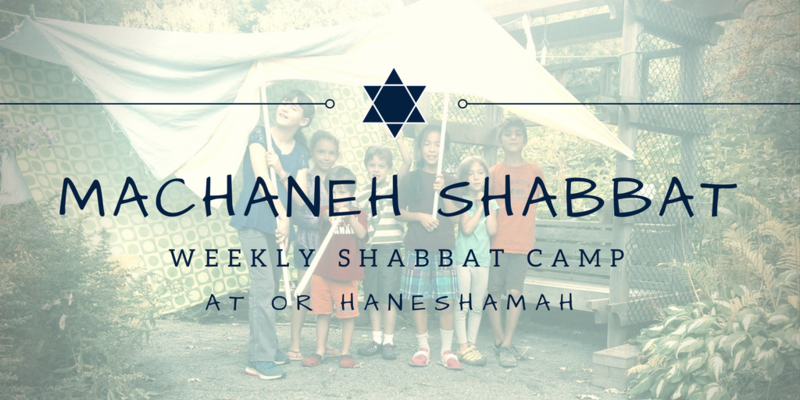 Family-based Jewish learning in a social camp atmosphere every Shabbat morning. For children (JK-8), welcoming the participation of parents, grandparents, and younger siblings. Saturday mornings from 9:45 am to 12:45 pm, September to June. Machaneh Shabbat (Shabbat Camp) is an inclusive, family-based weekly Jewish learning adventure providing an in-depth Jewish education for families with children of all ages. Our camp model allows us to explore Torah, prayer, Hebrew and the Jewish year through field trips, drama, art, social action, cooking, building and more! We believe that we can ignite the lifelong spark for Jewish living and learning through community connection and taking the time to live Jewishly, especially on Shabbat. This spark is the key to raising engaged and informed Jewish young people! Program led by an experienced Jewish educator under the direction of Or Haneshamah Rabbi Elizabeth Bolton. $950 for the first child. $50 Progressive discount for each additional child (e.g., second child $900, third child, $850, etc.). Register and pay in full before September 16, 2018 and receive a $50 discount per child. All Machaneh Shabbat families — OrH members and non-members — pay the same fees. Machaneh Shabbat families who choose to become first-time OrH congregation members will receive a 50% discount off the full family membership for the first year, or a free Associate membership — a significant savings over the already reduced first-year family membership dues. For details, contact membership@orh.ca. Payment can be made in full at time of registration. To arrange payment in two installments (September and January) or in monthly installments please contact membership@orh.ca. Families may register at any time during the year and fees will be pro-rated based on remaining sessions. If you are not satisfied at any time, we will refund fees for the remainder of the program. No child will be turned away for financial hardship. To confidentially discuss financial aid or any other financial matters please contact membership@orh.ca. Click here to complete the Machaneh Shabbat Registration Form. Note: You will be prompted to sign in to your Orh account in order to register. If you are not an OrH member and do not have an account, please contact membership@orh.ca for instructions on creating an account. Once set up you will be able to sign in and register. If you already have an account but have forgotten your login information or are having trouble logging in, please contact webmaster@orh.ca. Registration is ongoing: you may register any time during the year. Machaneh Shabbat takes place on Saturday mornings, 9:45-12:45, from September to June. First class is Saturday, September 15, 2018, but you may enroll at any time. Click here for the 2018-19 Schedule.